Get ready to revisit the world of The Lion King again! Season two of The Lion Guard has been announced, and the casting of Scar has been revealed. Disney Junior revealed more about the second season in a press release. Check that out below. “Acclaimed film, television and stage actor David Oyelowo (Selma) will voice the iconic role of Scar, the villainous younger brother to Mufasa, in Disney Junior’s The Lion Guard, an animated series that continues the epic storytelling of Disney’s acclaimed feature film, The Lion King. Scar will appear in the flames of a volcano after Simba and Nala’s young son, Kion, unwittingly summons him by using the Roar of the Elders in anger. Season two of the hit series will premiere FRIDAY, JULY 7 (8:00 a.m. EDT), with two back-to-back episodes on Disney Channel. Scar will first appear in the series during a special extended episode titled “The Rise of Scar,” premiering SATURDAY, JULY 29 (9:00 a.m. EDT). Additional guest stars for the new season include Tony Award-winning actress Renée Elise Goldsberry (Hamilton) as Dhahabu, a charismatic golden zebra; Academy and Grammy Award-winning rapper, actor, producer and poet Common (Selma) as Kiburi, an arrogant crocodile; Kristofer Hivju (Game of Thrones) as Kenge, a ferocious monitor lizard; AJ Mclean (“Backstreet Boys”) as Kuchimba, an adorable golden mole; Carla Hall (ABC’s The Chew) as Mpishi, a “foodie” African harrier hawk; Christopher Jackson (Hamilton) as Shujaa, a massively strong gorilla; CCH Pounder (Avatar) as Kongwe, a wise old turtle; Rico Rodriguez (ABC’s Modern Family) and Raini Rodriguez (Disney Channel’s Austin & Ally) as Raha and Starahe, a brother and sister zebra duo; Sinbad (Disney’s First Kid) as Uroho, a comedic baboon; Michael Dorn (Star Trek: The Next Generation) as Bupu, a large sable antelope; Justin Hires (MacGyver) as Hodari, a tiny gecko; Jacob Bertrand, Mekai Curtis and Cade Sutton (stars of Disney XD’s Kirby Buckets) as Chama the elephant, Furaha the monkey and Mzaha the antelope, respectively; and Landry Bender (Disney Channel’s Best Friends Whenever) as Makini, Rafiki’s spirited young mandrill apprentice. The Lion Guard follows the adventures of Kion, the second-born cub of Simba and Nala, and his diverse group of friends, as they unite to protect the Pride Lands. Created for kids age 2-7 and their families, the stories are designed to communicate positive lessons about teamwork, community and diversity. Popular across all viewing screens, the series has reached 85 million Total Viewers across linear TV in the past year, including 17 million Kids 2-8 and 34 million Adults 18-49, and amassed an additional 72 million engagements via the Disney Junior App and Disney Junior VOD. Each episode of The Lion Guard incorporates Swahili words and phrases and includes original songs. The Education and Science experts at Disney’s Animal Kingdom theme park serve as consultants, inspiring original stories based on their first-hand experiences, and advising on the characteristics, behaviors and habitats of various African animal species. 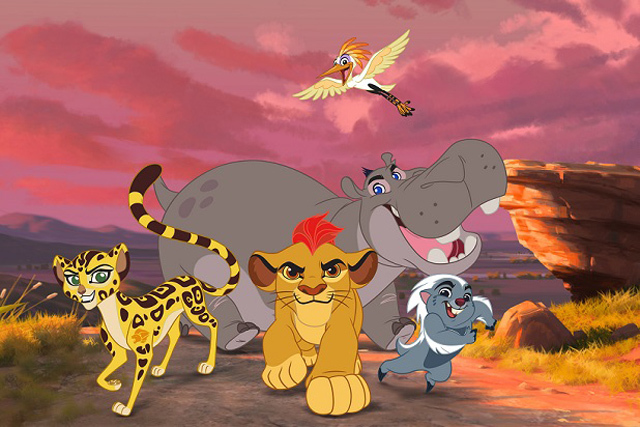 The Lion Guard voice cast includes: Rob Lowe as Simba, Gabrielle Union as Nala, Max Charles as Kion, Joshua Rush as Bunga, Atticus Shaffer as Ono, Diamond White as Fuli, Dusan Brown as Beshte, Eden Riegel as Kiara, Jeff Bennett as Zazu, Andrew Kishino as Janja, Vargus Mason as Cheezi, Jonny Rees as Mzingo, Khary Payton as Rafiki, Kevin Schon as Chungu and Timon, Gary Anthony Williams as Mufasa and Ernie Sabella who reprises his role as Pumbaa. Are you a fan of The Lion Guard? Tell us what you think. More about: Disney Junior TV shows: canceled or renewed?, The Lion Guard, The Lion Guard: canceled or renewed?